When this mission is first introduced, the mission giver, Uchu, can be found with Jonah near the Unuratu's Home Base Camp. (screenshot) (Later in the game, they will both move to the SKULL CAVE, so you may accept the mission there. This will be covered in the HIDDEN CITY REVISIT WALKTHROUGH.) 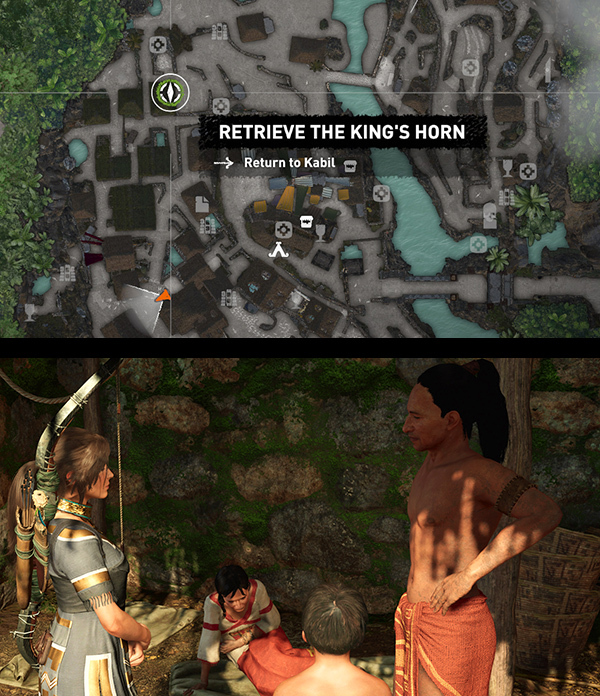 Uchu tells Lara that he's sent three of his best scouts to retrieve three sacred items for Etzli's coronation: the King's Horn, the Savior's Amulet, and the Champion's Bow. Uchu already has men going after the Amulet and Bow, so Lara offers to help Retreive the King's Horn from the instrument maker, Kabil. The goal is to Speak with Kabil, but Uchu suggests she might also approach Kabil's wife, Abra, since she has a mellowing influence on her cranky husband. 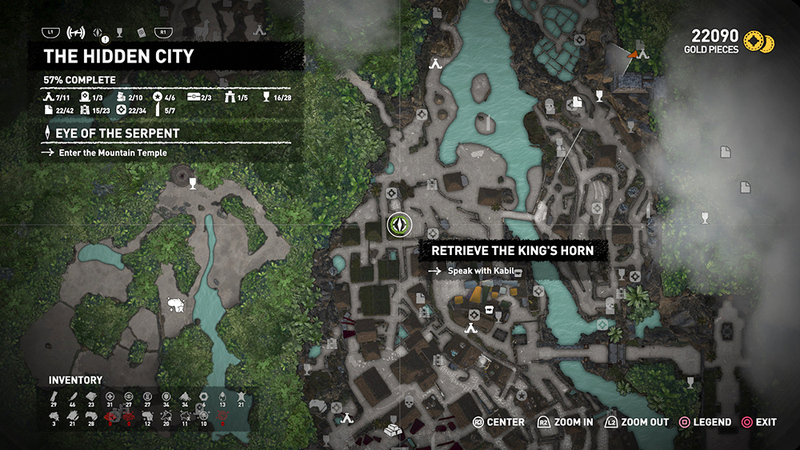 Kabil and Abra can be found at their home, on the west side of the river. The location is marked with a green icon on your map. 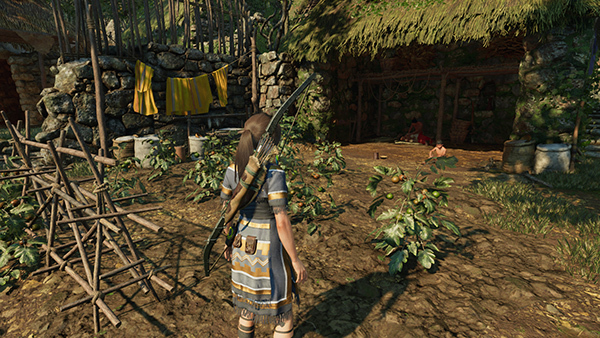 (screenshot) The house has tomato plants outside and some yellow cloth hanging from a line. 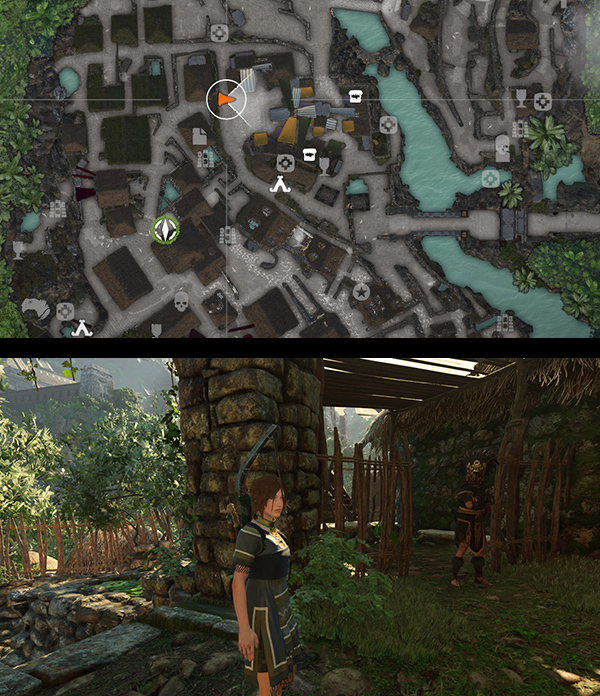 (screenshot) When you approach, the couple's son rushes out to meet Lara then calls his father. She asks for the Horn and Kabil refuses. The boy explains that when the cult heard that Kabil was making the Horn, they poisoned the family's crops, causing Abra to fall ill. The boy's brother, Cualli, went to the market for healing herbs but hasn't returned. 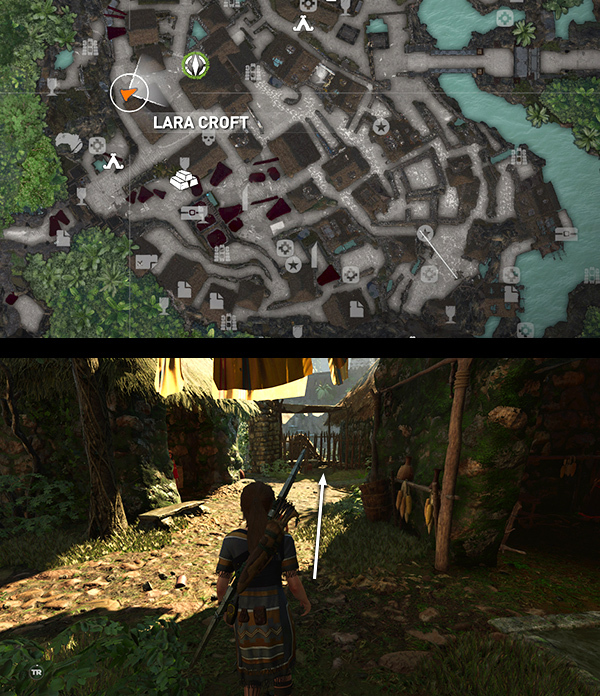 Lara offers to Go to the Market to investigate. If you head for the green mission objective marker near the west entrance to the MARKET, you'll overhear two women talking about Abra's poisoning. 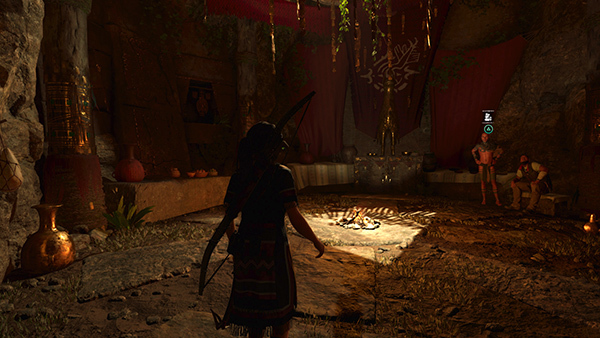 (screenshots) Speak to one of them and she'll tell Lara that the boy, Cualli, is being held by one of Kukulkan's men. Head for the next marker, at the top of the stairs to the south-southeast, to Locate Cualli. The guard, Chimalli, is standing in front of a pen where the boy is being held, preventing you from talking to him. 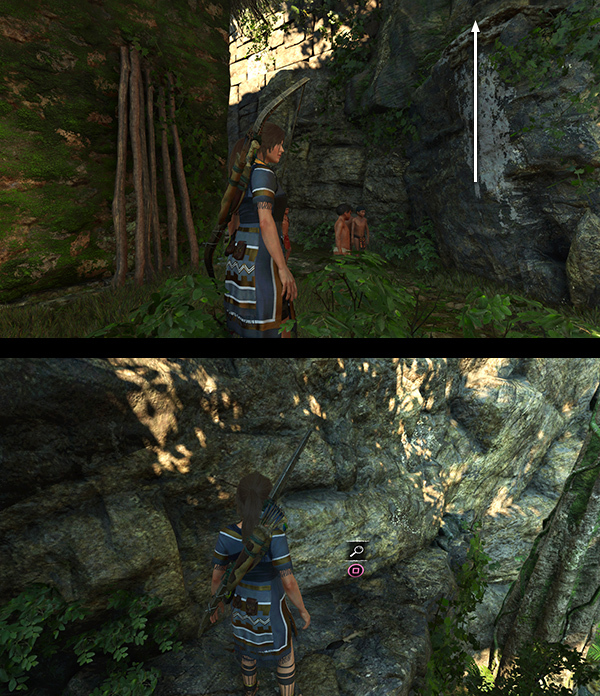 (screenshots) Chimalli is not exactly friendly, but he won't attack Lara, so we won't mark him as an enemy. Lara attempts to draw the guard into conversation, and he tells her all the mischeivous children of Paititi should rounded up, especially one Serpent Guard's son named Yamil. Your next goal is to Talk to Yamil, whose location, just a short distance to the west, is marked on your map. When you find him, he's standing near the base of a high ledge with some other boys. (screenshots) He tells Lara that he took his father's ceremonial knife to show his friends. Chimalli, the guard, found out and threw the knife up onto the ledge so the boys couldn't reach it. Lara offers to Retrieve the Knife. It's also marked on your map, but you don't need to go far. The ledge is right where the boys are standing. Scramble up and get the knife. (screenshots) Drop down and Return the Knife to Yamil. The boys ask Lara what she wants in return, and she explains that she's trying to help Cualli. Lara asks the boys to lure Chimalli away so she can talk to Cualli. The boys run over to the guard and start taunting him and throwing rocks. They run off and he takes the bait, leaving the pen unguarded. Return to the pen to Free Cualli. In case you get disoriented, the pen is once again marked on your map, just east of where you met the other boys. 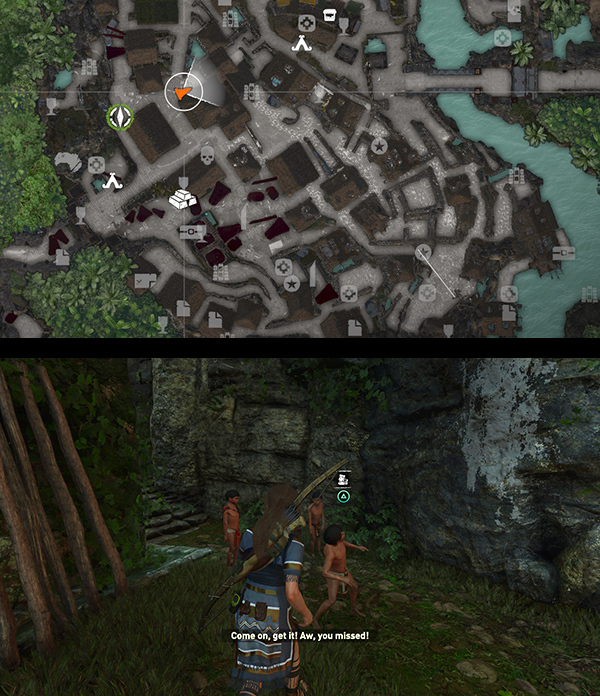 (screenshots) When you enter the pen, Lara explains to the boy that she wants to help. She takes the herbs for his mother and tells him to meet his friends at their cave hideout. Finally, return to Unuratu's Hideout with the King's Horn. Depending on where you are in the game, Uchu will either be in Unuratu's Home or SKULL CAVE. The location will be marked on your map in green. 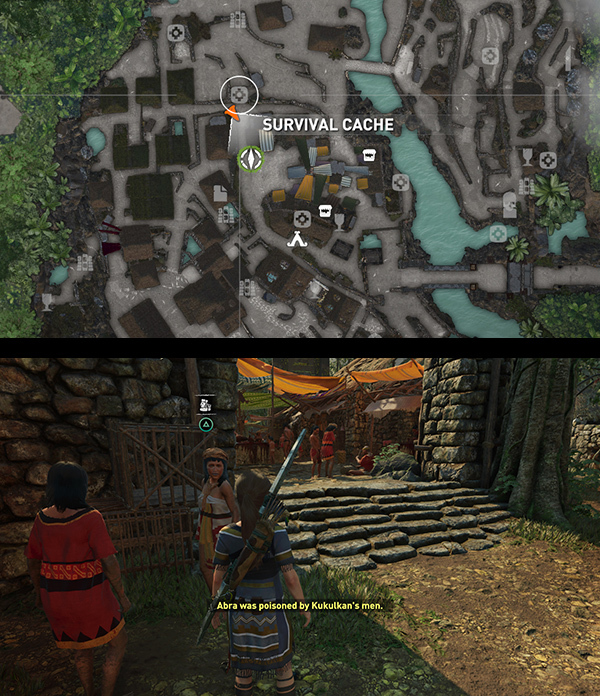 There are base camps in both places, so you can use Fast Travel or go there on foot. When you return to Uchu, he gives you 350 gold pieces for retrieving the Horn and offers the second part of this mission, which is covered on a separate page. 12/8/18 - Added gold award for completing the mission.